Pinnacle Series lightbars feature our innovative optics design, Fusion Technology, the first ever optics designed much like a lighthouse to boost the light farther & wider for a bright, safe warning signal. SoundOff Signals first full sized LED lightbar. Available with Take Downs & Alley Lights.Clear or Color Lenses Available. Split Rear available only with clear lenses. NEW! SoundOff Signal's LED3 Cargo Warning Trunk Light is perfect for trunk illuminationpaired with rear warning safety for officers! SoundOff Signals LED Front Windshield lightbar. Narrow design has minimal windshield obstruction, Lightbars are custom built to your color & vehicle specifications & include a 5 Year No Hassle Warranty. SoundOff Signals LED Rear Deck lightbar. Narrow design w/minimal windshield obstruction, lightbar is visible even when the trunk is open. Lightbars custom built to your color & vehicle specs & include a 5 Year No Hassle Warranty. Our new Pinnacle Series Lightbars feature our exclusive Fusion Technology optics. Fusion Technology fuses the output aspects for a super wide angle output that shines farther than any other light. 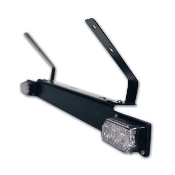 Value priced Skyfire LED Lightbar is designed for the Amber and volunteer market.